Tempted remains Squeezes signature single and can be found everywhere, from television commercials to video games to the daily airwaves of radio stations. Erykah Badu and James Poyser have teamed up to take the classic track down a totally new route, turning it into a soulful, raw performance with Miss Badus vocals shining through, bringing a brand new light to the song. Produced and engineered by Squeeze aficionado Steve Mandel, the track features an incredible crewing of backing musicians, ranging from Thundercat to Derrick Hodge and Ali Jackson. Tempted is the 3rd installment from the Swindles project and will be available globally as a 45 single for Record Store Day 2019. 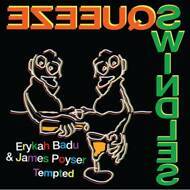 The A-Side features the new rendition of Tempted, with the B-Side showcasing the instrumental of the new version. Limited to 3,500 copies worldwide.